Help your child say goodbye to nightmares and welcome pleasant dreams with her very own dreamcatcher. 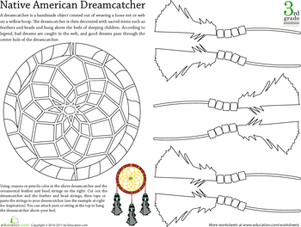 According to Native American legend, a dreamcatcher wards off bad dreams by catching them in its web. They're traditionally made out of a loose net and willow hoop, but your kid can colour and cut her own with this beautiful printable. The Nez Perce is a Native American tribe in the Northwest U.S. This worksheet will hep your little learner to explore Native American history and culture. This Native American group played an important role in American history. Discover the history of the Cherokee tribe with this worksheet all about Native American culture. Young readers can discover the history of the Choctaw Native American tribe with this history worksheet. Help your child understand which tribal groups lived where with this Native American Tribes map. Share in the adventures of the Shawnee tribe with this reading comprehension worksheet on Native American history. Your budding historian can learn about the Navajo, the largest Native American tribe, with this worksheet. Ride the range with the Comanche culture in this worksheet about the history of Native American tribes. The peaceful Hopi are a Native American tribe in Arizona. Your little learner will learn Hopi history, as well as some of their culture. The Shoshone were an important Native American tribe. Your little historian will learn about the culture and history of this tribe. Young readers will learn all about Native American history with this worksheet.